BigUpRadio.com proudly presents the all new weekly reggae dancehall radio show called "Green Lion Radio Show." 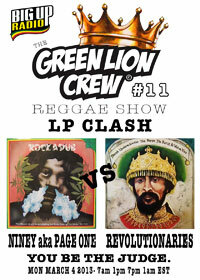 Hosted by DJ and producer Zeke Stern, the Green Lion Reggae show features speciality programming in which Stern curates the program based around a unique theme, exclusive pre-releases from the Green Lion catalogue, one on one interviews and Green Lion's signature 'LP Clash' where seminal albums in the history of the music face off and the listener can decide who wins. This week it's Dub for Dub with Niney The Observer aka Page One with his 1978 LP "Rock a Dub" going up against The Revolutionaries 1977 LP "Don't Under Estimate the Force, The Force is Within You" Two Heavyweight Killer Dub LPs, who will take the title? Court is in session! Catch the Green Lion Reggae Show every Monday on the dancehall station at bigupradio.com. The show times on Mondays are: 7am, 1pm, 7pm and 1am Eastern Standard Time. The Green Lion Reggae Show, keeping you up to the time and close to the roots.